Great tactile feedback, great typing experience. The volume rocker rocks! 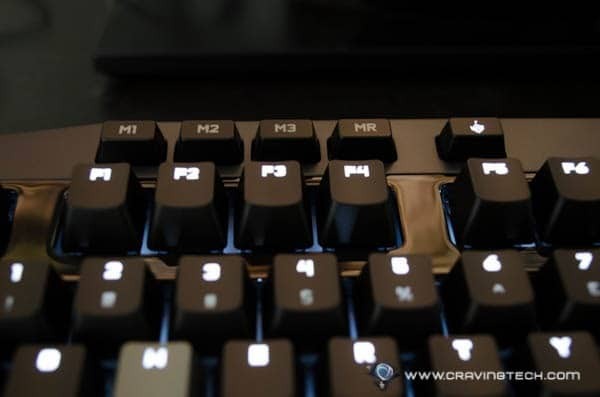 Logitech G710 Plus Mechanical Gaming Keyboard review – Mechanical gaming keyboards.. they have always been delivering awesome tactile feedback and experience both for gaming and work. I have tried quite a lot of mechanical gaming keyboards from various key types (Cherry MX Blue, Brown, and Black). 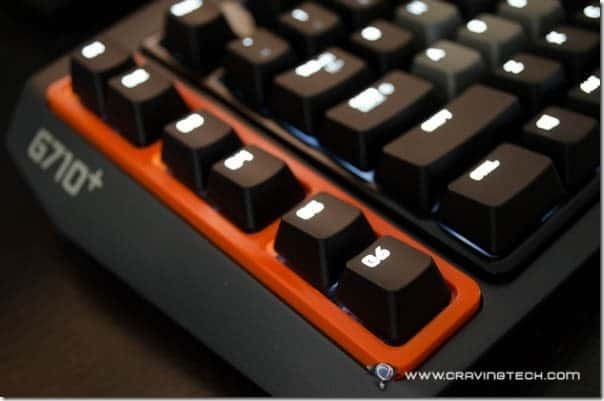 They are similar yet not the same, but my most favorite one so far is the one with Cherry MX Brown keys like what the Logitech G710 Plus (Logitech G710+) is equipped with. I’ve never reviewed a gaming keyboard from Logitech so I had a mixed feeling when I had the opportunity to review one. 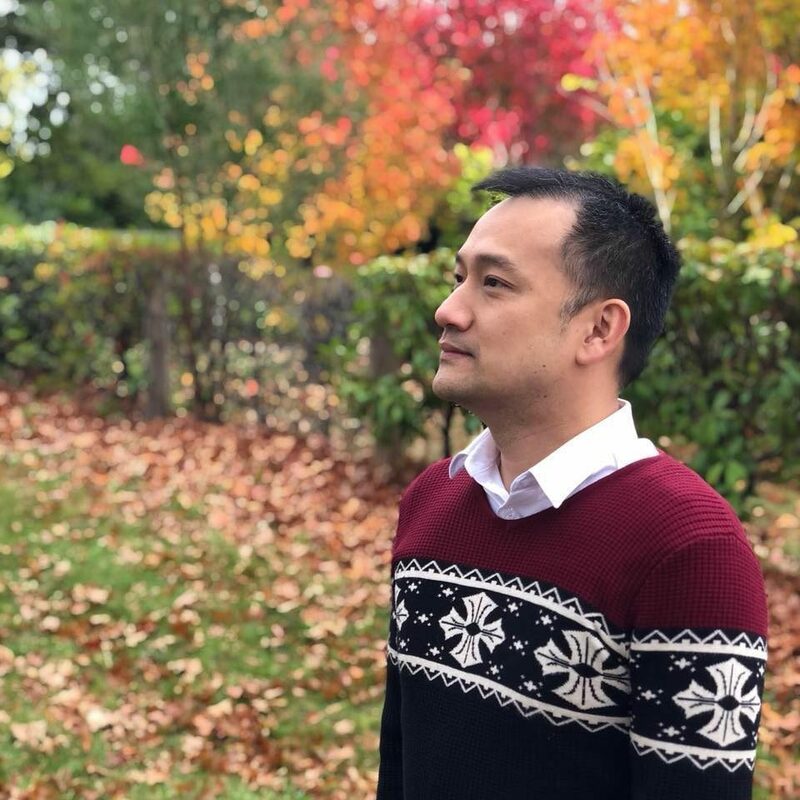 I know they make great quality products (I’ve reviewed some of their products in the past such as the Logitech UE Mobile Boombox, Logitech Ultrathin Keyboard Cover for iPad, Logitech Harmony One remote, and a few others). On the other hand, they are not really a focused gaming peripheral manufacturer like Razer or SteelSeries, so this is sort of a trial for me. Once I unboxed the product and had a feel of the G710+, however, I’m totally sold. 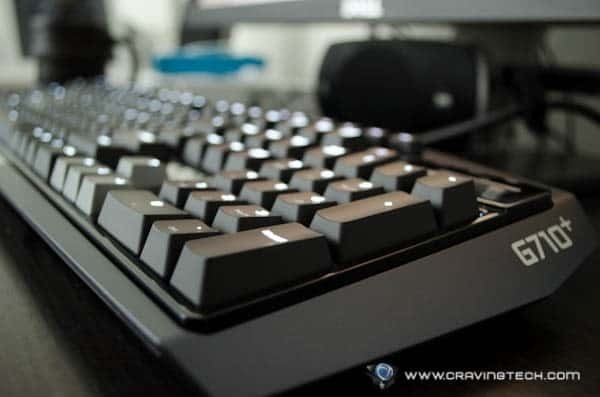 For a start, the design of the keyboard is not of a boring type, thanks to the pleasant color theme (black, gray, white, and orange). 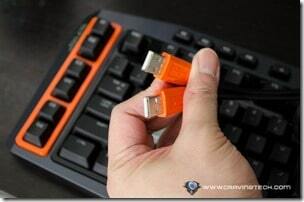 They are pleasant to the eye and make the keyboard stand out in a way. 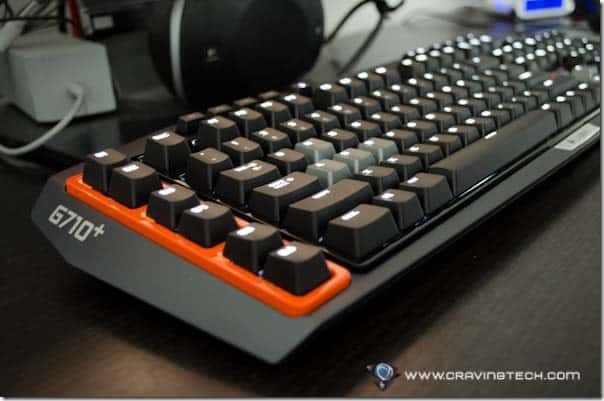 I especially like how the macro keys are highlighted with an orange layer around the keys, giving it a nice, elegant look. 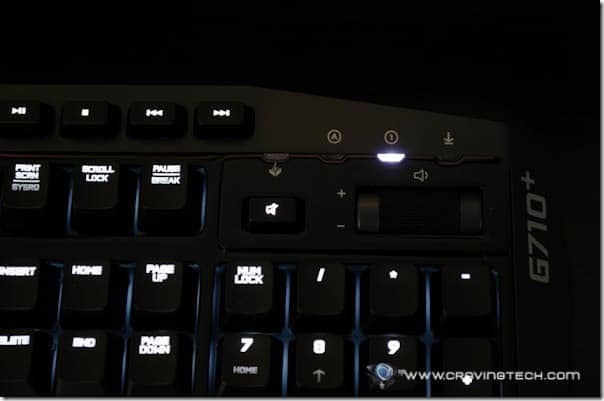 The entire keyboard (not just some keys) is backlit for gaming in complete dark environment. You can adjust the lighting levels with a dedicated button (from off to the brightest) on the G71o+. The WASD and keypad keys have a separate illumination level of their own so you can make them stand out from the rest of the keys. 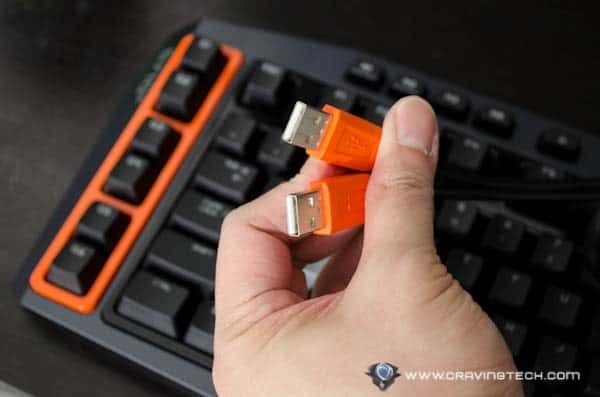 I find that the highest setting to be very bright compared to the other keyboards I’ve tried, so it’ll be perfect for gamers who like to game with no room lights on. Rather than using a “Function” key, you have separate multimedia control keys and a super-awesome volume rocker (oh, yeah). I have a tendency to change my volume very frequently (varied from listening to music, watching movies, or playing games) so having this handy rocker rocks! The rocker feels solid and stiff, so should never register by accident. There is also a dedicated gaming mode which will disable Windows key, if you happen to press it by accident every time you game. 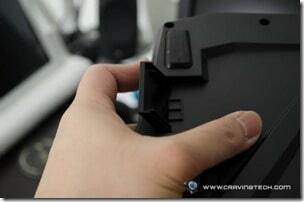 Removable palm rest is also included in the packaging though it is fine to use the G710+ without. Thanks to the Cherry MX Brown keys and the overall keyboard design, typing on the G710+ feels so good that it has now become my main keyboard (for both gaming and work). Though it is advertised as being quiet (Logitech adds a built-in dampening ring under each keycap), you shouldn’t expect mechanical keyboards to be as quiet as the good old rubber dome keys. 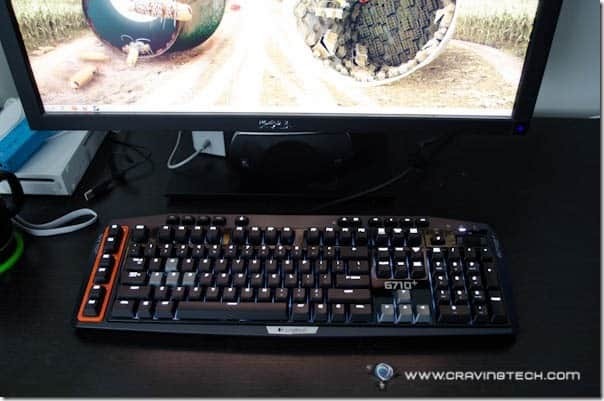 Still, if you are into mechanical keyboards, you’ll be happy with the G710+. You can also configure the “G” keys on the left side of the keyboard for running macros, shortcuts, and more. You can switch between memory profiles using yet other dedicated buttons on the top (and you can set the G1-G6 keys differently on each profile). Within the Logitech software, you can even save soft profiles to your computer which can detect a launched game and switch to that specific profile. There are even online saved profiles for specific games to get you started. Thanks to these many options, playing TERA (an MMORPG game) has been so much easier as I can now save a bunch of shortcuts (including a long text to say with zero ms delay) and skill combos. Really useful and nifty. 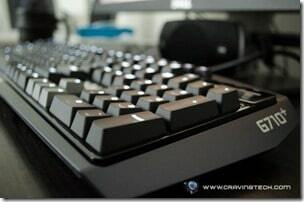 The keys are responsive and great to use for gaming in different genre (FPS, Strategy games, etc). 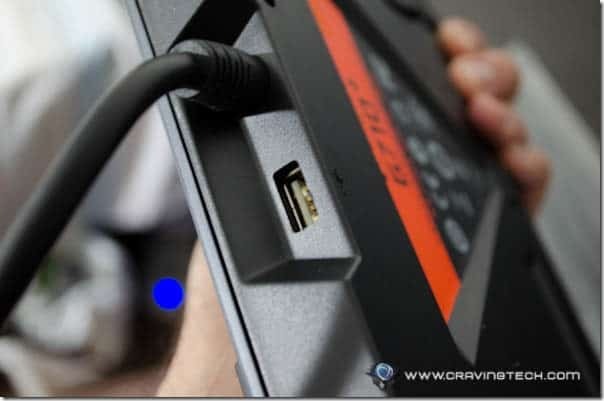 The Logitech G710+ also comes with an extra USB slot so you can take advantage of this to plug your wireless gaming mouse receiver or a USB headset (rather than having to go all the way to the back of your CPU). Overall, I really love the Logitech G710 so much that I have made it as my main keyboard, for both gaming and work. The material doesn’t feel cheap, keys are responsive with good tactile feedback, plenty of dedicated buttons which means that the tedious Function key is no longer needed, plenty of memory banks to store your macros per game, and a rocking volume rocker! I’m not sure what I don’t like about the Logitech G710+, to be honest. I probably wish we can specify different backlighting color and that it looks more exotic. Ok, scrap that. I really love the Logitech G710+! 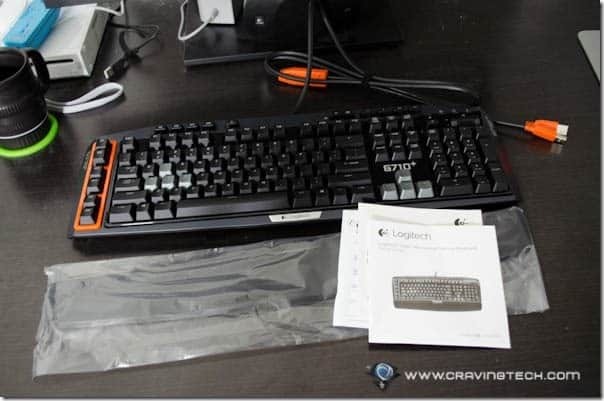 Disclosure: Logitech G710+ mechanical gaming keyboard review sample was sponsored by Logitech for the review. Opinions are 100% mine.